Don Green got his chance at high-A St. Petersburg through someone else's misfortune, according to The Savannah Morning News. A St. Petersburg pitcher had broken his hand and the club needed some pitching help. Green made the move up to St. Petersburg in late April from single-A Savannah. He ended up staying at St. Petersburg for much of the rest of the season. He got into 35 games and posting a 2.79 ERA. Though he stayed in St. Petersburg for that season, Green couldn't stay in the pros. That was his second professional season. It was also his last. 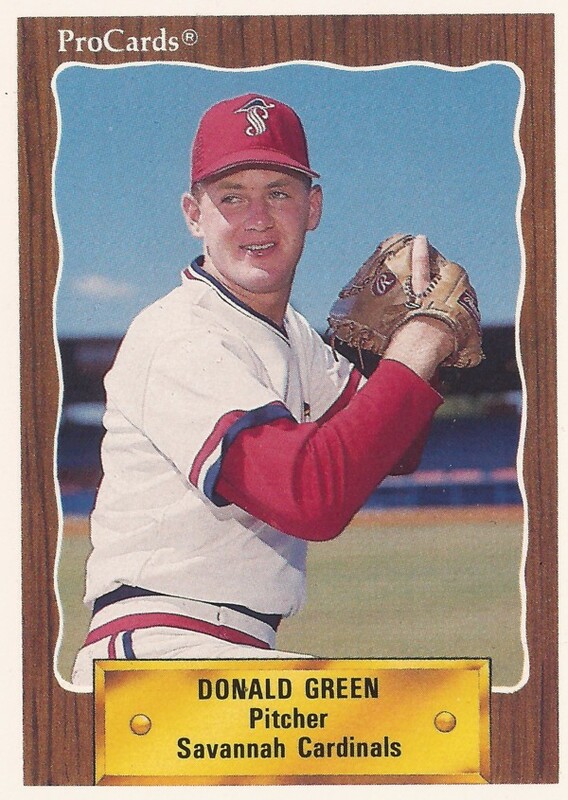 Green's brief career began in 1989, taken by the Cardinals in the 15th round of the draft out of Iowa State University. Green is also credited by his full name, Donald Green. Green played that first year at short-season Hamilton. He got into 35 games in relief, picking up two wins, one save and a 3.13 ERA. Green moved to Savannah and then St. Petersburg for 1990. He got into 12 games at Savannah, giving up two earned in 12.1 innings of work. He then moved to St. Petersburg. There, he got into those 35 games, starting one. He picked up two wins and a 2.79 ERA. It was his final season as a pro.